By Nina Frizoni on November 4, 2013 in Articles, Blog & Vlog! 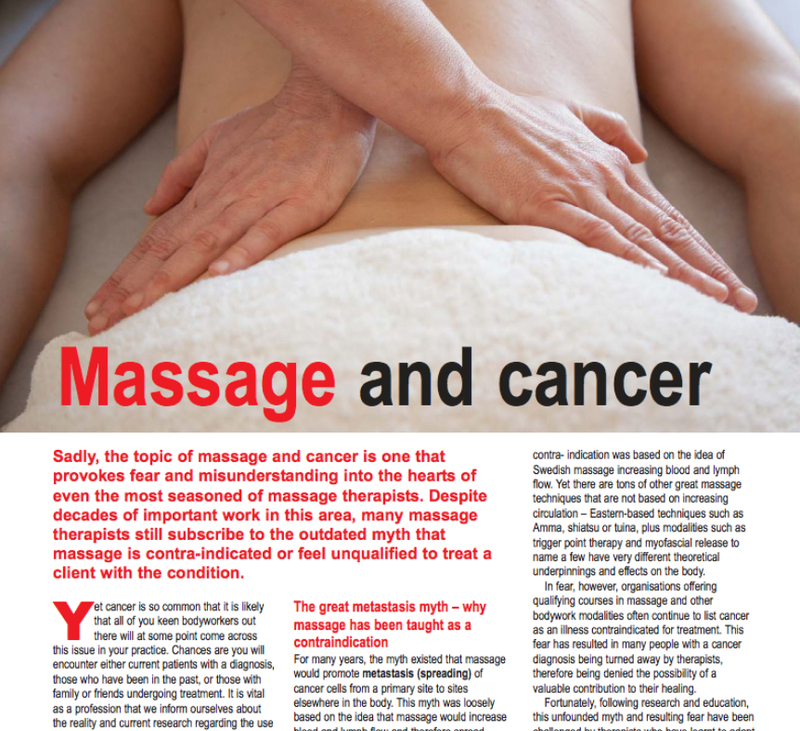 During recent work updating and developing the introductory course on Oncology Massage for Advanced Massage students, which we had previously workshopped nearly two years ago, we looked again at a substantial number of studies which have been done evaluating the benefits of massage for people who have been diagnosed with cancer. They are mostly small trials, many taking place within Health Science departments of universities or specialist cancer treatment centres as well as at the Touch Research Institute in the University of Miami School of Medicine, Florida. Some of the studies have been attempts to gather the evidence so far in order to review what the data can tell us when looked at collectively. Overall the findings are consistently positive and it seemed to us that they were almost certainly applicable to people with any chronic condition which involves long term medical management, with its associated stresses and anxieties, subject to the approval of the medical specialists involved in their care. We must emphasise that there is no suggestion, either by us or in any of these studies, that massage therapy in itself can be used to treat cancer. The benefits have been tested mainly in relation to the various side effects of treatments and their aftermath. One of the larger studies took place at the Memorial Sloane Kettering cancer centre in New York in 2004. It involved 1,290 cancer patients and showed that symptom scores – which included stress/anxiety, nausea, insomnia, pain, fatigue and depression – were reduced by 50% with the use of massage. In 2005 the Touch Research Institute reviewed the positive effects of massage therapy on the body’s biochemistry, in particular on decreased levels of cortisol and increased levels of serotonin and dopamine. The research reviewed included studies on depression, pain syndromes, auto-immune conditions (including asthma and chronic fatigue) and studies on the reduction of stress at work, the stress of aging, and pregnancy stress, as well as immune studies involving people with HIV and breast cancer. Cortisol is the hormone the body releases in response to stress. Its primary function is to increase the level of blood sugar. Serotonin is a neurotransmitter found mainly in the gut, where it regulates intestinal movements. It also regulates mood, appetite and sleep and is popularly thought to be a contributor to feelings of wellbeing. Dopamine is also a neurotransmitter having many functions as well as enabling the healthy functioning of the nervous system. These include acting as a vasodilator (widening the blood vessels), moderating insulin production and contributing to the kidneys’ maintenance of the sodium/potassium balance. These studies combined suggest the stress-alleviating effects (of decreased cortisol by an average of 31%) and the activating effects (increased serotonin and dopamine averaging 28% and 31% respectively) of massage therapy can be achieved for those coping with a variety of medical conditions and stressful experiences including cancer. Some of the other individual studies at the Touch Research Institute showed that breast cancer patients had improved immune function, with increased white blood cell and natural killer cell numbers, after a course of massage; that postoperative arm massage for women who had lymph nodes removed during breast surgery significantly reduced symptoms such as pain and restricted shoulder mobility; and that even just a short foot massage for people who had been hospitalised due to cancer reduced their perceptions of pain and nausea and increased their state of relaxation. Harvard Medical School published a study in January 2013 piloting a randomised controlled trial which showed that massage significantly increased the quality of life for people with advanced metastatic cancer, reducing pain and anxiety and improving alertness and sleep quality. Another study in the Department of Psychosomatics and Psychotherapy at a university in Berlin, published in 2011, showed massage therapy as an “efficient treatment for reducing depression in breast cancer patients”. The most notable aspect of the results of these and many other studies is the suggestion that massage as a therapeutic intervention can be helpful not only for musculoskeletal and soft tissue pain and restriction, but can also make a significant difference to the way we feel and our quality of life.